People with a passion for history and architecture dream of traveling to Europe for a chance to see some of the most wondrous buildings, bridges and churches in history. While you may not think of Texas in the same way, it doesn’t lack in history! Austin is a short day trip away from many historical sites, such as the Texas Hill Country castles. A lesser known day trip is the Painted Churches of Texas tour. It’s perfect for anyone interested in art, architecture and small town Texas history. As German and Czech immigrants arrived in Texas, seeking religious freedom and economic prosperity, they established communities that paid homage to their homelands. We’re familiar with neighboring cities such as Fredericksburg, Gruene and New Braunfels. 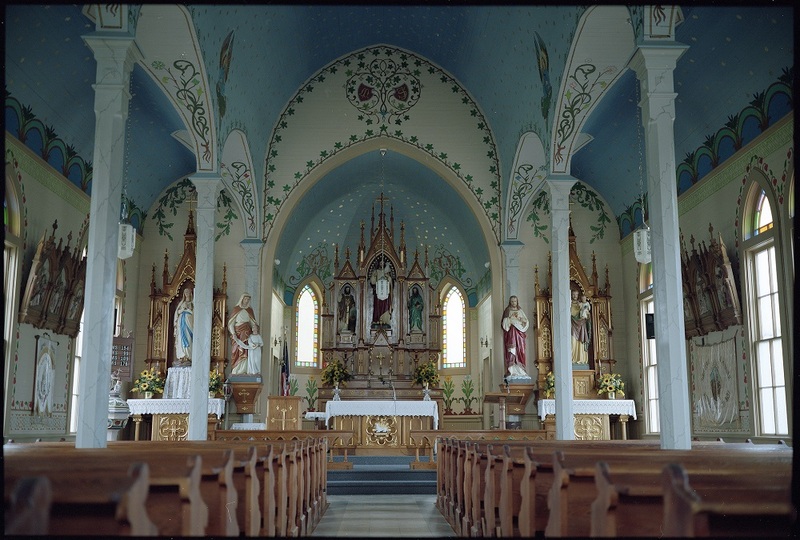 But you’ll find a cluster of small towns to the east of Austin that have something in common: their painted churches. The church became a symbol for European immigrants’ prosperity in the new land. As they settled into their surroundings, they built and decorated elaborate churches to celebrate their success and keep their spirits high. While you’re welcome to do a self-guided tour of the churches, I encourage you to consider a guided tour for a more robust explanation of the churches’ architecture and history. Tours can be scheduled through the Schulenburg Visitor Center and are $10 a person. Reservations are required at least two weeks in advance to ensure availability. If you do choose to do a self-guided tour, keep in mind that all the churches are active places of worship, so be respectful of services and events taking place. 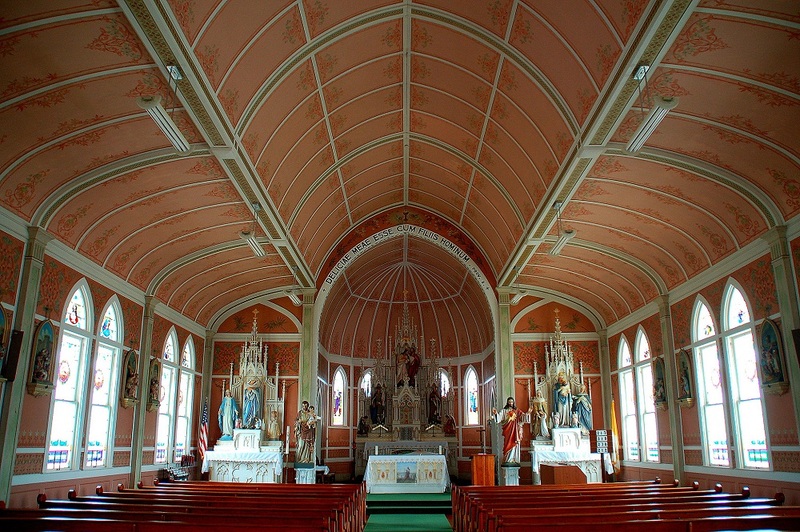 The painted churches are open to visitors from Monday to Saturday, 9 a.m. to 4 p.m.
Nicknamed the Pink Church, the current St. John the Baptist Catholic Church was built in 1917. This is the third church built on this site–the first two were destroyed by hurricane and fire, respectively. This structure, built with Gothic Revival-style architecture, is much simpler than the first two. Instead of embellishments and columns, a decorative painter was hired to give the interior its liveliness. Located in Dubina, Saints Cyril and Methodius Church is probably the most elaborate of the bunch. After the first church was destroyed by a hurricane in 1909, the community hired famed architect Leo Dielmann to design the second church. Dielmann designed over 100 churches in Central Texas over the course of his career and was extremely well-known in the area. Today, several of his buildings and churches are listed as Historic Places. The stunning architecture of Saints Cyril and Methodius is paired with beautiful interior paintings, stenciling, stained glass windows and statues. Unlike several other churches in the area, St. Mary Catholic Church in High Hill has a brick exterior with a wooden interior. Church leadership encouraged communities to build churches out of brick or stone when so many were destroyed by storms and fires. St. Mary was the first church in the area designed by architect Leo Dielmann. He designed it using Gothic Revival style and relied heavily on decorative painting to create the illusion of Gothic ceilings. While building this church, Dielmann took on another project in Fredericksburg: the construction of St. Mary’s Catholic Church. Fredericksburg was a wealthier community and didn’t need to rely on decorative finishes to create the illusion of Gothic vaults. I encourage you to check out the architectural differences between these two churches. St Mary’s Church in Praha is one of the oldest painted churches, built in 1895. The plain stone facade does not prepare you for the ornate interior, designed in the popular Gothic Revival style of the era. 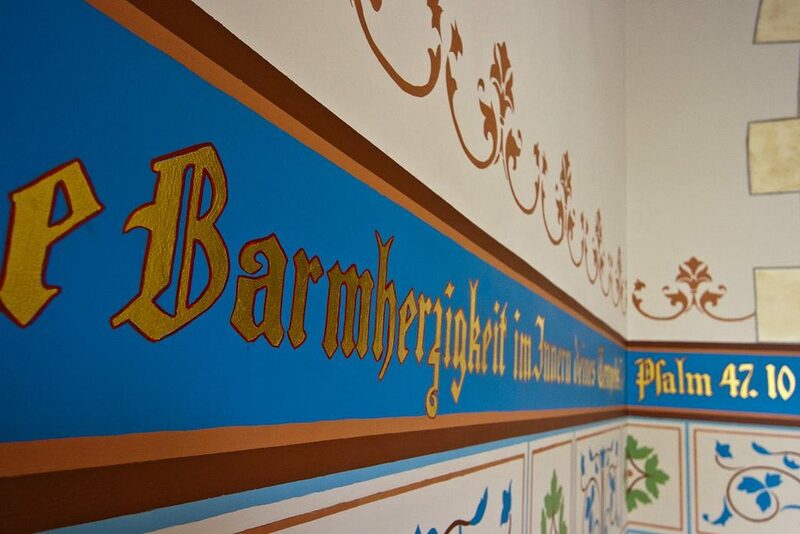 Almost every inch of the interior is adorned with stenciling, drawings or paintings. The ceiling and walls were painted by fresco artist Gottfried Flurry, beautifully complementing the impressive hand-carved, white altar. The church asks that visitors exit the church by 3 p.m. on Saturdays. As I mentioned earlier, St. Mary’s in Fredericksburg was designed by renowned architect Leo Dielmann. 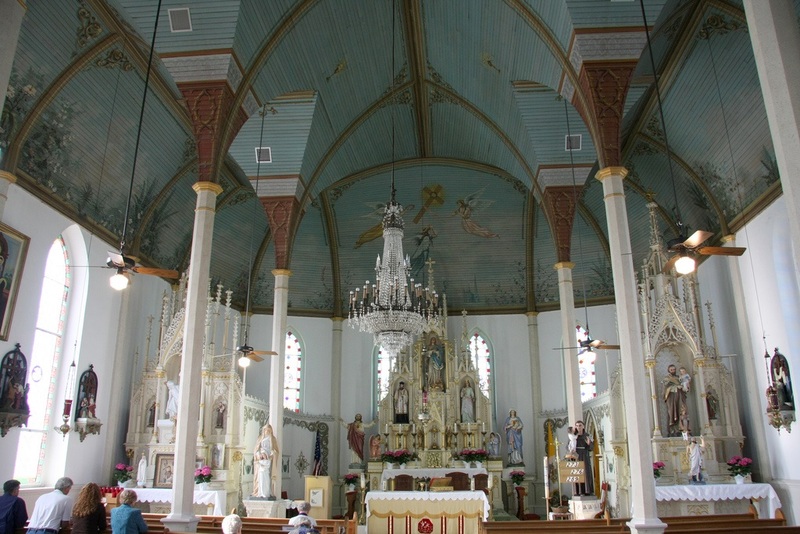 Because of the congregation’s large budget–the total cost of building and furnishings was about $40,000–Dielmann was able to incorporate architectural elements he could not implement in some of the other painted churches of Texas. 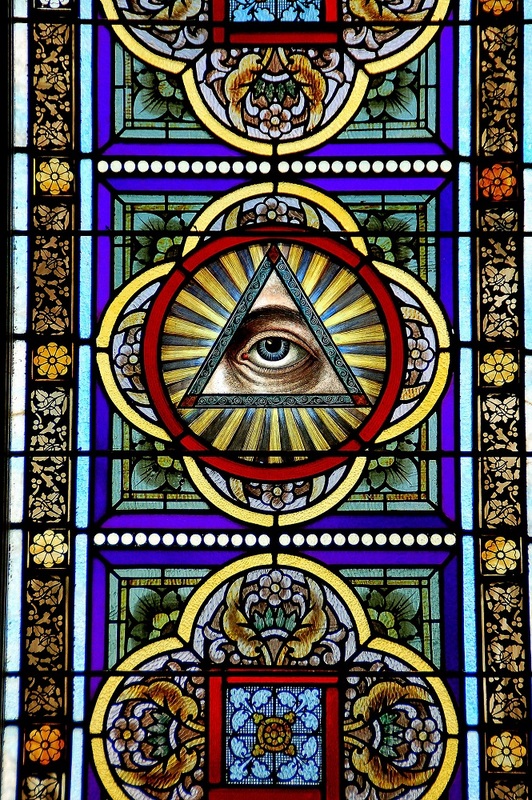 The beautiful stained glass and stunning altar really show the craftsmanship of the era. 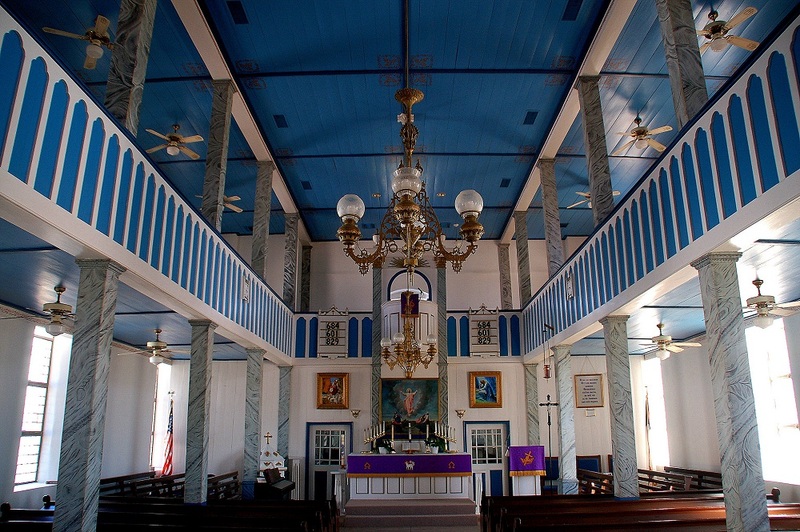 Founded in 1854, this beautiful blue and white church deserves an honorable mention, as it has the tallest pulpit in Texas. The two levels of St. Paul Lutheran Church were common for the time. Women and children often sat on the upper level, while men sat on the bottom. However, practitioners recall that it was the opposite at St. Paul: men sat on the top and women and children sat on the bottom. Today, the church holds services in German during major festivals. 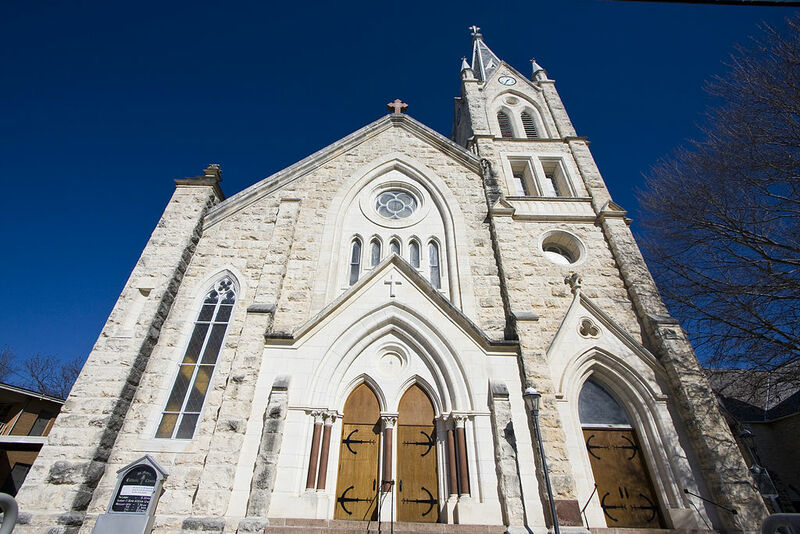 If you want to learn more about Central Texas’ rich history, enjoy the painted churches tour and see for yourself some of the most stunning art and architecture of the early 20th century. What is your favorite type of art or architecture?